DSWD celebrated 55th anniversary and 25 years of Sisters of Charity of St. Anne at Elsie Gaches Village, Philippines. DSWD celebrated 55th anniversary and 25 years of Sisters of Charity of St. Anne at Elsie Gaches Village, Philippines on February 06, 2019. We are very proud and thankful to Sr. Savita Parmar from Ahmedabd who is serving in this center. 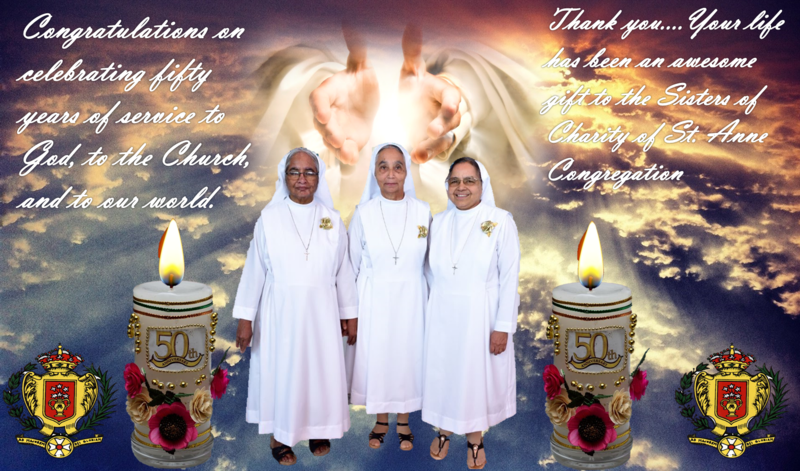 Sr. Savita Parmar belongs to the Sisters of Charity of St. Anne congregation. 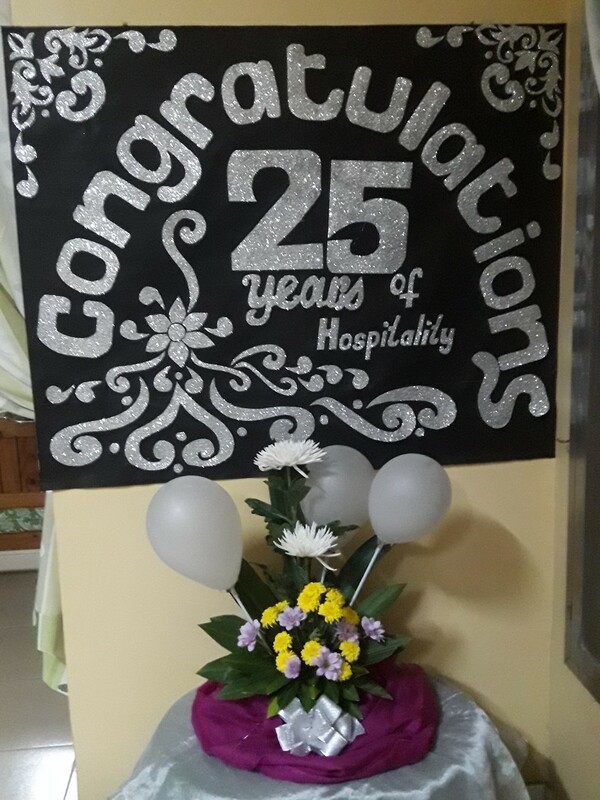 Department of the Social Welfare and Development celebrated 55 years and The Sisters of Charity of St. Anne celebrated 25 years being their partners in this center, Elsie Gaches Village. Besides the clergy there were government officials, current staff, retired staff of the facility. Various companies, donors, sponsors, volunteers were present too. The Friends of Elsie Gaches Village ( group of ladies and a gentle man who brought The Sisters of Charityof St. Anne in this center) Besides The sisters Charity of St. Anne Congregation there were other sisters from various congregations to witness the event. Certificates of appreciation was given to the staff of EGV. Some of the donors were presented with awards – plaque of appreciation The sisters of Charity of St. Anne “FUNDACION JUAN BONAL” received a plaque which was received by The General Councilor Sr. Gladys Velendia who came from Spain The Provincial superior Sr. Philomina Maliakkal. There was a presentation (dances) by the children and staff of Elsie Gaches Village. Nearly 1,000 people were served a delicious dinner catered by the sisters. It was a really very great day of rejoicing and thanks giving to the Almighty God and to the people who are helping the center in various ways to give dignified life to those children, youth and adults who are abandoned by their own. This institution needs our support. You can help out by sponsoring a house parent or donating medical supplies. If you are interested to help, please call their office at 817-2225. Time to give back to those who need it most! When Sr. Mary Varguese, a nun who used to work with special children in India, arrived in the Philippines to take care of a centre of mentally-challenged persons, the conditions were so bad that she was “completely shocked.” However, after some years of hard work, the situation has greatly improved. We visited the place. When Sr. Mary Varguese of the Sisters of Charity of Saint Anne was sent to the Philippines in 1994 to work at a government-run centre for mentally-affected persons, the Indian nun did not foresee the kind of challenge she would get into. A professional special education (SpEd) teacher in India, Sr. Mary was sent to Elsie Gaches Village (EGV) in Alabang, Muntinlupa City in Metro Manila, to do missionary work. Sr. Mary said she was “completely shocked” when the EGV then appeared to her more like a prison than a centre for mentally-challenged persons. “They were all locked up in a room with grills from ceiling down to the floor. They were like prisoners who are acting very wild and not behaving properly. Nobody were calling them by their names but bulag (blind), negra (black), unggoy (monkey), or baboy (pig),” she shared. “When I first came in here at EGV, I was completely shocked. There are no wheelchairs; the children are smelly and infected with scabies. Most of them were naked and had none but lampin (dirt cloth) to wipe their faces with,” she said. “I just could not swallow it. The children were all abandoned. They had absolutely nothing and nobody to begin with,” she said. 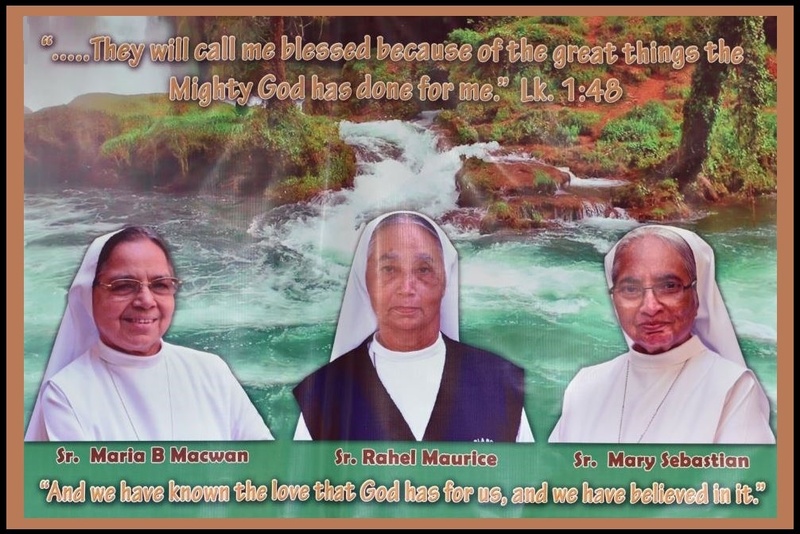 Although it took Sr. Mary six gruelling months to adjust to her new environment at the EGV, she nevertheless found her “very challenging” mission to be worth all of her effort for the past 18 years. “This work is definitely hard but I love it. I have learned to love these children who I saw growing right before my very eyes. They may not have anybody in their lives but I am here for them,” she said. Sr. Mary has witnessed how the EGV developed as an institution and a community since the Sisters of Charity of Saint Anne partnered with government social workers to care for the mentally-challenged persons at the centre. She was one of the first nuns from the Sisters of Charity of Saint Anne who came to the EGV in 1994. “The situation then was very bad, but EGV now has improved a lot,” she said. From a 16-hectare residential compound, the EGV now is a well-maintained centre that cares for the sick, abandoned, orphaned and neglected mentally-challenged Filipinos housed in 14 cottages. The centre has patients as young as five and as old as 79. Sr. Savita Parmar, other sister working in the EGV admitted that the nuns’ work at EGV is hard but “When you see God in these children, everything becomes easy. They don’t have demands like normal people, they don’t complain and are always appreciative of what is given to them. They are angels because they don’t have malice and are very satisfied people,” she said. Sr. Savita pointed out the nuns also take pride in seeing the special children grow healthy, athletic, competitive and functional. “Deaths are few recently compared to the previous years and the children are active in sports. They even compete in special Olympics that are organized outside EGV,” she said. 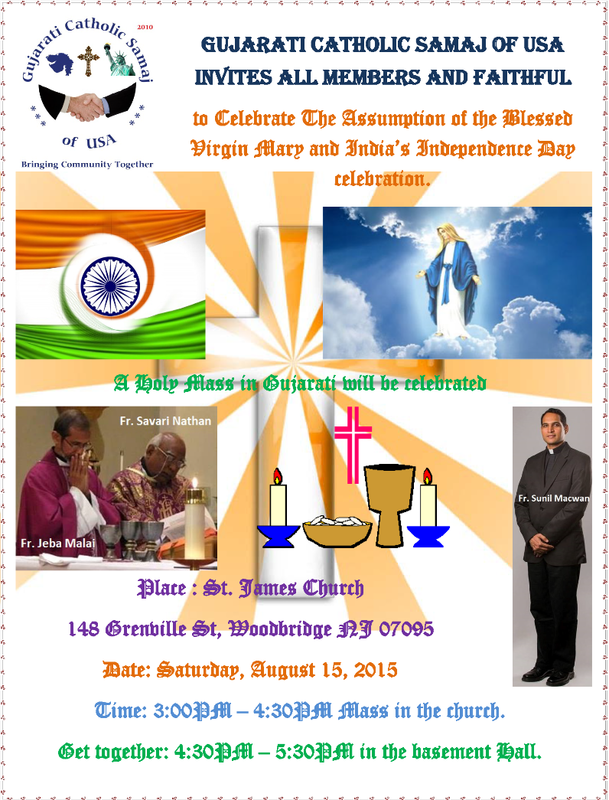 GCSofUSA invites all member and faithful to celebrate The Assumption of The Blessed Virgin Mary and India’s Independence Day. Please note Fr. Sunil Macwan is visiting Mr. Anil Macwan from August 11-16 and has promised to celebrate Gujarati Mass for us. Fr. Jeba Malai & Fr. Savari Nathan will confirm in few days. So we will be fortunate to have three priest celebrating the Holy Eucharist. 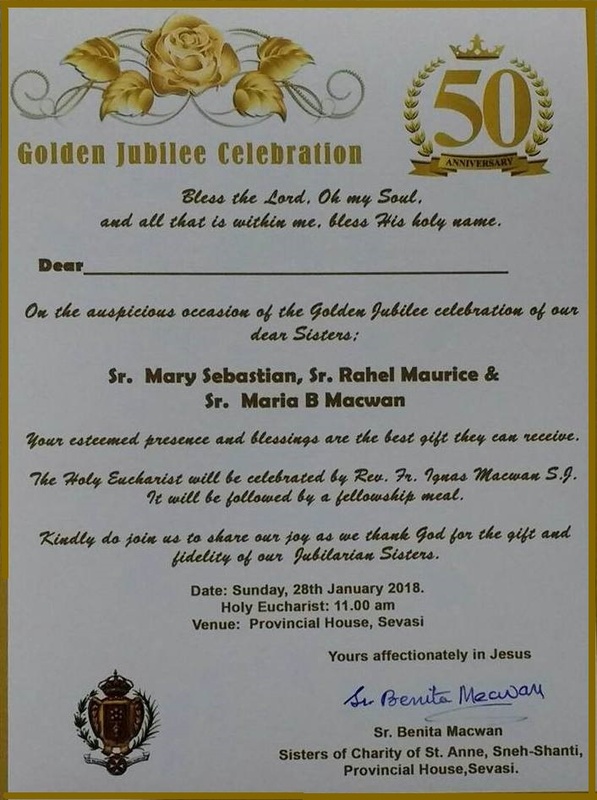 Sr. Savita Parmar from Nadiad who is currently working in Elsie Gaches Village in Philippines at a Center of mentally challenged persons, will also join us for the mass.